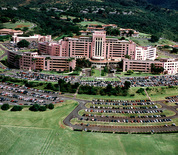 Tripler Army Medical Center, located in Honolulu, Hawaii, is the only federal tertiary care hospital in the Pacific Basin. It supports 264,000 local active duty and retired military personnel, their families, and veteran beneficiaries. In addition, the referral population includes 171,000 military personnel, family members, veteran beneficiaries, residents of nine U.S. affiliated jurisdictions (American Samoa, Guam, and the former Trust Territories), and forward-deployed forces in more than 40 countries throughout the Pacific.